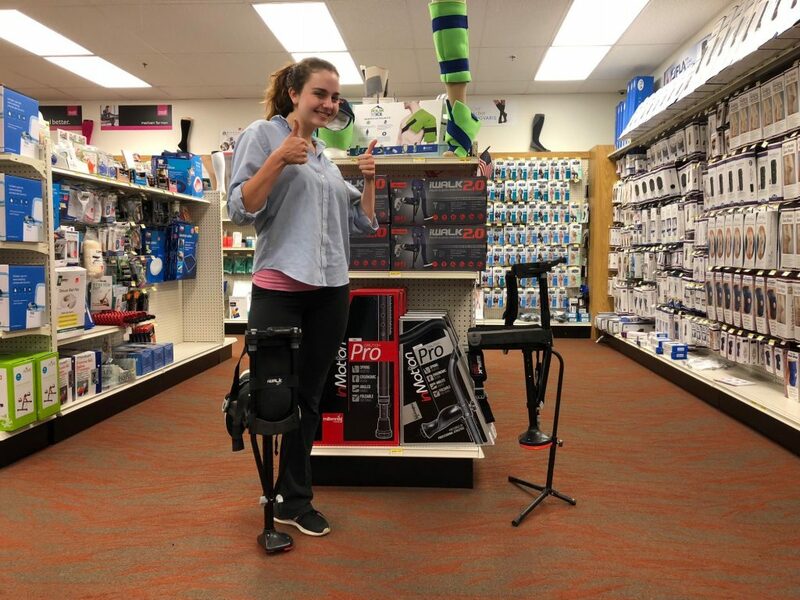 If you are looking for an upgrade to traditional crutches, today’s featured product is about the iWalk 2.0; a hands-free mobility device designed to replace crutches. Aside from uncomfortable underarm rubbing and bruising, crutches can actually make getting around more difficult—you can’t carry anything while you’re using them! Stairs and uneven terrain can be dangerous to use with crutches. Tasks that require standing can be close to impossible. Is there a better solution? Forearm crutches (aka European style crutches) get rid of underarm rubbing and bruising, but still require the use of your hands. Knee scooters or knee walkers are fast and allow you to use your hands, but stairs are a no-go. The iWalk 2.0 should be the mobility aid of choice for anyone suffering from a lower leg injury who is also looking to regain mobility quickly. The iWalk 2.0 combines the best features of traditional crutches, forearm crutches, and knee scooters into one package that offers the best-in-class mobility. You may be thinking the iWalk 2.0 sounds perfect. Well, just like anything, there are a few strings attached. The makers of the iWalk 2.0 suggest that before even looking at the iWalk as a mobility solution, the user should be able to walk up a flight of stairs without using the handrail and be able to balance on one leg for 30 seconds (before the injury). The iWalk 2.0 takes a decent amount of stamina to use, these tests are a bare minimum. If you are thinking about the iWalk 2.0 and you are over 60 years old, you may want to think twice. The makers of the iWalk have a set of guidelines to follow that will tell you if you are a good candidate for the iWalk 2.0. If you meet all of the requirements in the survey, you are a good candidate for the iWalk. Weighing over 275 pounds is also a point of consideration when looking at the iWalk 2.0. The more body mass you have, the more your body ‘gets in the way’ of the iWalk. The iWalk works as an extension of your leg—if it can’t be securely strapped to your leg, it will not work as intended. Amputees with amputations below the knee can also use the iWalk. On top of passing the iWalk questionnaire, amputees seeking to try the iWalk 2.0 should also have a minimum 4” of residual limb below the knee. If you are going on a trip that requires a lot of foot travel, the iWalk 2.0 might not be the best choice. A knee scooter is going to be faster than the iWalk in any ‘distance’ trip or vacation. A knee scooter is also not strapped on to your body, allowing for easier transfer times into cars or other vehicles. Any situation that requires walking and stairs or elevation changes without ramps will be better handled by the iWalk. A knee scooter is the best mobility aid for lower leg injuries if you want to get somewhere quickly, but it falls short when it meets a flight of stairs. Knee scooters are far more accessible and easier for most people to use. Using a knee scooter is like riding a kid’s scooter—you push with your strong leg, ride it out, then repeat. A knee scooter won’t let you navigate in close quarters or go up a flight of stairs. The iWalk works great on stairs! 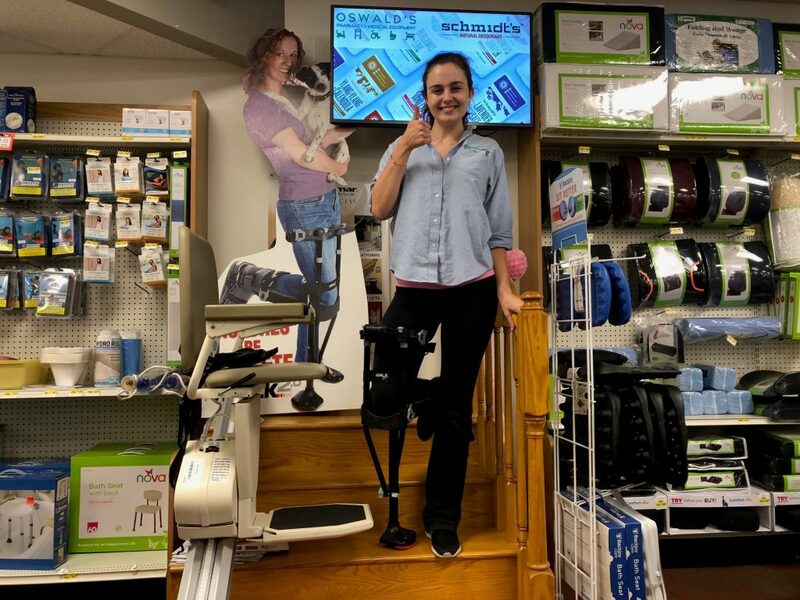 If you need to find the right mobility aid for a lower leg injury and you fulfill the ‘requirements’ set out by the makers of the iWalk 2.0, you should come in and try them both out. If you like the iWalk 2.0 better for most situations but have a trip with a lot of walking coming up, fear not; we rent knee scooters. The iWalk 2.0 is a truly unique product and it offers tremendous independence for a very low cost. 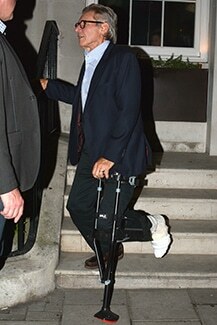 If it was good enough for an injured Harrison Ford, it is probably good enough for the rest of us. 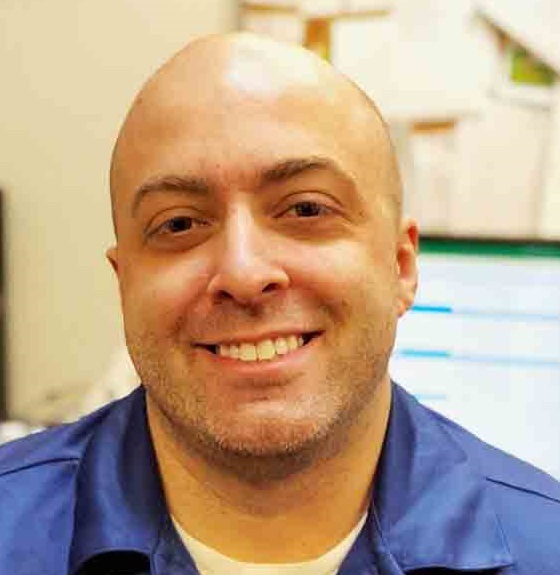 If you have any questions, don’t hesitate to send us an email or give one of our experts a call.